After a substantial drop in July 2018, U.S. housing starts surged back in August 2018. Privately-owned housing starts in August were at a seasonally adjusted annual rate of 1.28 million units, 9.2% higher than the July estimate and 9.4% above the rate a year ago. Compared to July 2018, single-family housing starts were up 1.9%, and multi-family starts increased 29.3% in August 2018. South-wide average stumpage prices were up for both pine and hardwood sawtimber, but pine chip-n-saw, pine pulpwood and hardwood pulpwood prices dropped in this quarter. Similarly, both Southern pine and hardwood lumber prices were down in this quarter. The price of Southern pine lumber was $437 per thousand board feet, down 22% from last quarter but up 11% from last year. In the third quarter, North Carolina timber prices followed the similar trend of South-wide average prices. While both pine and hardwood sawtimber prices were up, average stumpage prices for pine chip-n-saw, pine pulpwood, and hardwood pulpwood were down compared to last quarter. According to TimberMart-South, the average pine sawtimber price was $25.83 per ton, up 2.7% from last quarter and up 11.1% from the price a year ago. It was about 8.5% above the south-wide average pine sawtimber price of $23.81 per ton. Pine sawtimber prices in both Eastern and Western NC improved in this quarter. The pine pulpwood prices, however, slumped dramatically in this quarter. The state-wide pine pulpwood prices in North Carolina averaged $10.16 per ton, down about 11% from last quarter. The average pine pulpwood price in Eastern North Carolina was $12.7 per ton, down 14.3% from last quarter and down 11% from the price a year ago. The hardwood sawtimber price increased slightly at the state-wide average of $24.6 per ton. 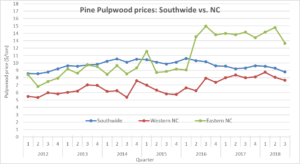 Both pine chip-n-Saw and hardwood pulpwood prices in North Carolina, however, dropped in this quarter. State-wide hardwood pulpwood prices averaged $3.4 per ton, down 9.5% from last quarter and down 14% from last year. More information on the 2018 third quarter stumpage prices in North Carolina.